Self Seal Confidential Double Window Envelopes 93500 At Print EZ. Self Seal Confidential Double Window Envelopes Item No. 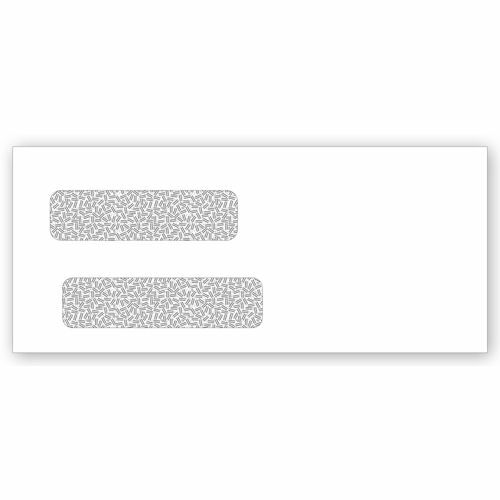 93500 Size: 4 1/8" x 9 1/2"
A popular choice among many of our customers, these double window envelopes are perfect to save time. They make for easy mailing with the self seal option that involves only ripping the butter paper and closing the flap. Stay away from messy gums or licking gummed flaps by choosing these high quality $24 white wove stock envelopes. Get complete security when posting checks and other private mails with the high quality of paper used and ensure no slipping or movement of the mail inside. Added security provided by the patterned lining is an additional attraction for many. If you are looking for flair and security at the same time, these double window envelopes are a definite pick for you.